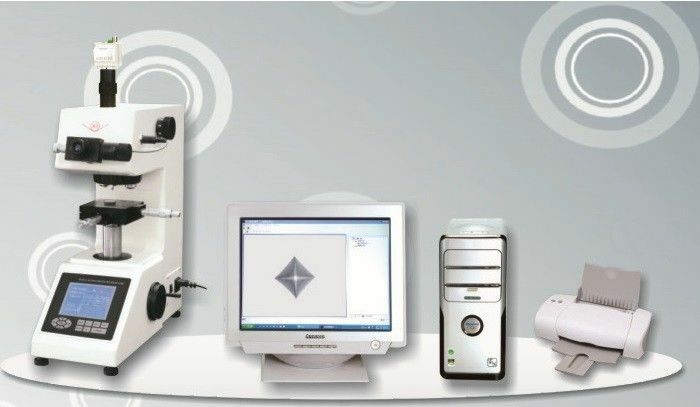 The UVMHT-M series vickers hardness tester CCD automatic measuring software system is the upgrade product of the vickers micro hardness testers, no more use the eyepiece for measuring, but use the CCD and PC to achieve the measuring function. The UVMHT-M series is simple and with easy operation, eliminating the human operating error, reduce the working fatigue of the operators. Offers fast and accurate measuring result. Using high resolution image capturing device to capture the indentation and output to the PC display. Supporting PAL and NTSC color / black & white video input. Automatic measuring the hardness value of the indentation through software signal transferring. Able to test the micro vickers, Knoop, cementite layer and apatite layer etc. The hardness value is switchable between different types. The image of the indentation is adjustable for the contrast, brightness. The image file and the data file is able to open, save or print. Users can check the data files and image files, the data files are displayed as forms and curve. The report files are able to output to Excel files. Supporting WINNT, WIN2000, WINXP operation system. The CCD measuring system only needs one click to finish the measuring, it is an advanced technology in the market. Also it is available to create a report of the measuring report, increase the working efficiency and reducing the human operated error. In the CCD measuring system, we also offer the surface processing measuring method, for example cementite processing, apatite processing or surface plating. Extra PCI slot required, with independent video card.